Sub: Academic Activities in the beginning of the Academic year 2017-18 after conduct of second Summative Assessment-Reg..
All the District Educational Officers in the state are informed that as per the Academic calendar of 2016-17, the academic year for 2017-18 commences from 21st March. 2017 and the last working day before the summer vacation is 23rd April, 2017. With vide reference cited above, the summative -2 exam schedule along with the schedule of valuation and issue of cumulative records is communicated by C& DSE. (a) A detailed analysis of answer scripts. (b) Diagnosing the strengths and weakness of the learners' concept /topic wise. (c) Undertaking the remedial teaching along with the regular teaching. (d) Ensuring the learners attain pre-requisite knowledge and skills for entry of next promoted class without any learning hiccups. (e) Conduct of school readiness for the classes I and II to improvement the enrolment in the early grades. Therefore the DEOs are requested to communicate the guidelines prepared by the SCERT for improvement of quality to all the schools in the district including TS model schools and KGBVs. Further they are requested to take necessary steps to implement the guidelines in letter and spirit in the schools and review the progress of the schools at least once in a fortnight. Instructions shall be given to all the MEOs and School complex HMs and other monitoring officers to visit the schools frequently and offer their academic support to the schools. 1. SA 2 Exams: Complete the Summative Assessment 2 by 16th March, 2017. 2. Valuation of answer scripts: Ensure that Valuation of answer scripts starts on the same day of examination and completed by 18-03-2017 in respect of all the subjects. Get the marks and as well as grades posted in cumulative records by 19th March, 2017. 3. Parents meeting / SMC/SMDC meeting: Conduct Parents meeting / SMC/SMDC meeting on 20th March, 2017 and handover of valued answer scripts and cumulative records of students to the parents. ~ Discuss issues of School related: In the same meeting discuss issues related to School Development and Academic Improvement. At the end of the meeting prepare a School Development plan with an emphasis on Academic improvement. ~ Appraise the parents: Appraise the parents on performance of the child during the year highlighting the students' strengths and weakness. 4. New academic year start: Begin the new academic year on 21st March, 2017 as per academic calendar. 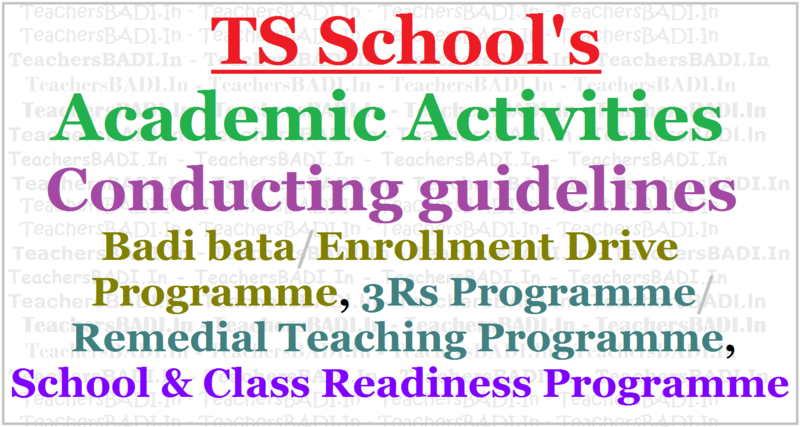 5. a) Regular Teaching Classes Start: Commence the regular teaching of classes (promoted classes syllabus and textbooks) on 21st March, 2017 and continue till the last working day before summer vacation ie 23rd April, 2017.
b) Remedial teaching: Ensure that along with regular teaching, special attention is paid to the students whose performance is not satisfactory in the last conducted SA2, and see that remedial teaching as well enough practice is provided to them in the identified weak areas from 21.03.2017 to 23.04.2017. 6. Parents /SMC/SMDC meeting on 23rd April, 2017: Conduct one more Parents /SMC/SMDC meeting on 23rd April, 2017 and appraise the progress of the children performance after the remedial teaching. 7. Organize Enrolment drive: Take steps to organize enrolment drive and make efforts to enrol students in the age group of 5+ to 6+ in classes I and II. For this meet the village elders and parents and educate them about the bright features of your school. 8. Banner: A banner may be placed prominently at the entrance of the school or in public places displaying "School admission is in progress". 9. Summer vacation: Declare summer vacation from 24th April to 11th June, 2017 as per academic calendar. 1. Based on the summative-2 results, for those children who are not up to the mark, try to find out where they are weak. For them the revision of syllabus should be supplemented with remedial teaching. 2. The remedial Teaching should focus on conceptual understanding of the child rather than memorization of principles, formulae, and algorithms without ensuring understanding. Understanding of the concept should precede the memorization of said aspects or practice work or drill work. 3. Based on the performance of summative assessment, diagnose the learner strengths and weaknesses concept wise / area wise. For this the teacher should make question wise, concept wise, lesson wise analysis. This analysis should be done child wise by using the under given format. Note: Put a tick (✓) mark if the student response is satisfactory, if it is not satisfactory put 'X' indicating the need or help from the teacher. 4. Conduct the diagnostic test: If necessary, to pinpoint the student weakness, to assess his pre-requisite abilities or to assess his present status of related knowledge or skills, the teacher has to conduct the diagnostic test. Sometimes the diagnostic test may be intended to test the basic skills, if the individual child is poor. 5. 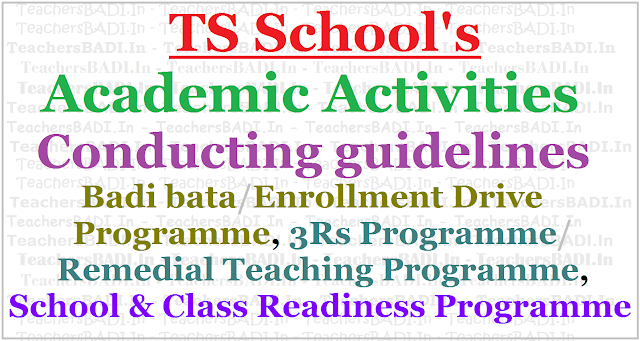 Identify the pre-requisite abilities/concepts to be learnt by the students in the concerned subject of promoted class and ensure that the students learn these things before commencement of summer vacation, this paves the way for the student to learn smoothly without any hiccups to the promoted class. 6. The diagnostic test may be framed for group of children or for individual learner depending upon the learner weaknesses. This test should not be for all the children. 7. Through the diagnostic test ascertain the weakness of the learner concept wise, skill wise. 8. The summative test as well as diagnostic test should be followed with remedial instruction. 9. The remedial instruction should be learner specific; it is not general classroom instruction. If certain group of children are found to be weak in same concept or subject area, the teacher may conduct remedial instruction in groups. Depending upon the abilities of the children (Knowledge and skill level), workable groups should be made. 10. In the remedial instruction, the teacher has to monitor the learner progress day wise at least week wise and step up the teaching for the next concept or subject area. 10. The remedial instruction should be carried out through tutoring, counselling. Individualized instruction or group instruction but certainly not in the shape of whole class instruction. Handholding is necessary for the students who deserve academic support. 11. Keep track of such students and their learning curve. 12. When you are correcting the answer scripts or note books, please do not limit to putting right or wrong symbols, please have a discussion with the student where and how he has gone wrong. Please try to correct the answer scripts with suggestive answers, correct the mistakes of the children and give comments suggesting the follow up action what the learner has to do. The teacher has to review their work periodically and if necessary daily. 13. If sizable students do not understand the concept, please do teach and re-teach with changes in the teaching strategies with appropriate illustrations and contexts. If feasible use ICT as teaching tool and as a learning tool. 14. Take the support of the peer group in helping the students who are lagging behind, but be cautious that their learning should not suffer while helping their peer group. 15. Have a working teaching learning plan for every learner and especially for the children who are lagging on individual basis or group basis till the examination. 16. Don't resort to drilling, mugging up without giving proper inputs for proper conceptual understanding. For conceptual understanding the above methods and procedures should be followed by the teachers. 17. Teacher should have two teaching plans: Every teacher should have two teaching plans, one is for general teaching, usually done for whole class and second for remedial teaching. This should be done based on the needs of the children. It could be done group wise or individual wise. 1. Hold subject teacher meetings in the school and discuss on the strategies to improve the children's learning, a status report on the children achievement and comprehensive plan shall be devised. This shall be discussed in the SMC/SMDC/Parents meeting to be convened on 20th March, 2017. 2. Hold teacher wise discussion on the students who need academic help to sail smoothly into promoted class. 3. Chalk out day wise, subject wise schedule for the remedial teaching during the school and if possible even after school hours. 4. Conduct regular review meetings without disturbing the school instructional hours with the subject teachers and review the instructional plans and children progress. 5. If subject expertise and pedagogical expertise are required, the services of neighbourhood school or from retired teachers, or the persons who are working in DIETs, CTEs, Teacher Education Colleges, Higher Educational institutions may be utilized. 6. Provide good ambience in the school and in the classroom. 7. Make school libraries accessible particularly subject related books and teacher hand books for ready reference. 8. Take the support of other teachers and tag the low performing students to these teachers for academic guidance and coaching, and ensure that every teacher in the school adopts two or three students. 9. Ensure the student progress data is updated in the given formats, progress of each student is monitored. 10. As per the needs of the learners, allocate certain periods exclusively for remedial teaching for those subjects learners need help. 11. Teachers are required to make a detail timetable for the above remedial periods in a week and exhibit it on the wall or in the notice board for the convenience of the students to plan their activities. 12. Remedial teaching should be carried out hand in hand without disturbing the regular subject teaching. School Readiness Programme: 21st March to 23rd April, 2017.
a) to create a child friendly environment in the school for class 1 & students . b) to make young children feel comfortable and happy to attend the school regularly without any fear. c) to develop pre learning skills of classes 1 & 2 children. 1. The content of the Programme is based on play, songs, rhymes, activities on Sensory - motor skills, scribbling, storytelling, picture reading, counting, arranging the objects in descending order and ascending order according to the size. Etc. 2. The three word formulae of Aata, Paata and Maata will be the process of achieving the objective. 3. Teachers to use the module given for School Readiness and Class readiness programme and as well use the workbook given during the summer vacation June 2014. 4. Teachers will collect additional information and stories on the topics given in School Readiness and keep ready for the programme.